There are some moments in parenting that make all the crumbs on the floor, stickers on the car window and rock-hard Legos underfoot feel worth it. For me, it’s seeing my daughter’s small hand peeking out from a heap of 45 stuffed animals on her bed, holding up an a strong and intentional sign language “I love you” as I turn off the light for the evening. I was pretty skeptical about the whole baby sign language thing. I thought it was for people who started their babies in violin lessons alongside beginning solid food. Tiger moms, shall we say. Well, them and people who needed sign language to communicate because someone in the family couldn’t hear. But my mind has certainly changed about baby sign language over the last few years. Turns out, most modern families, ours definitely included, can benefit from as many tips and tricks on communication as we can possibly cram up our sleeves. Long after Mo has started speaking, the “I love you” sign has hung around as a shorthand way to communicate within our family. I’ll flash it at her if we’re in a loud, noisy place place to let her know that a spiritual umbilical cord still binds us, even when she’s bravely left my side to try something new. Mike and I use it with each other daily in the resolute way soldiers might salute each other before heading into battle. And the grandparents, aunts and uncles have adopted it as a way to wave goodbye. 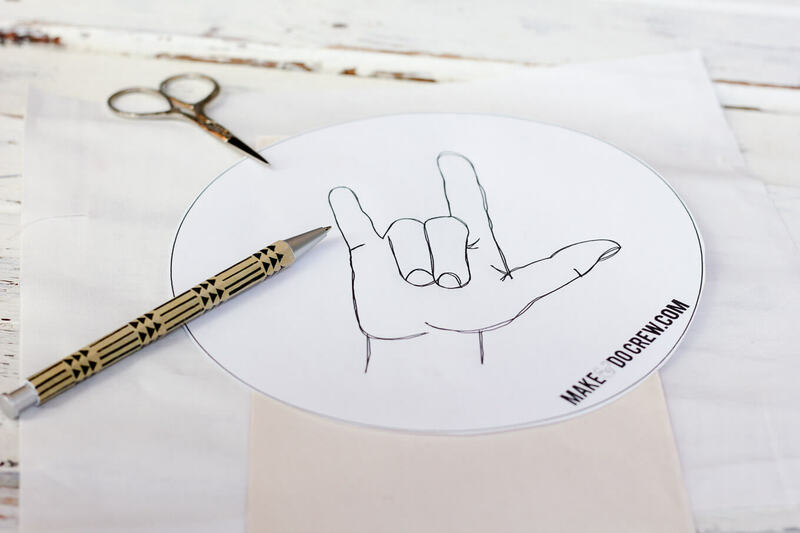 I’ve known for a long time this little one-size-fits-all ASL sign would make a perfect embroidery pattern. It’s simple, graphic and meaningful. 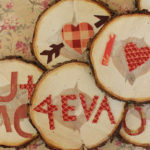 You could embroider this design for a thoughtful Valentine’s Day gift or a lovely DIY art project for a nursery. 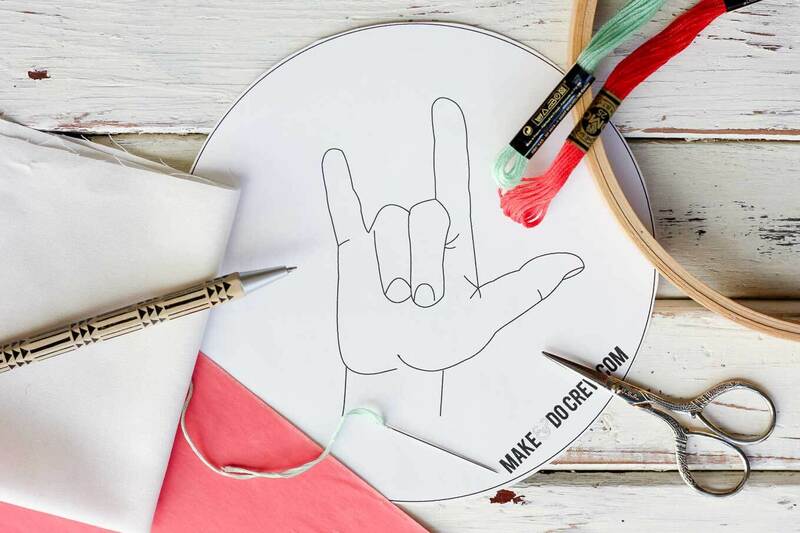 To download the free “I love you” embroidery design (+ all our other subscriber freebies), simply pop your email into the box at the bottom of this post. After you confirm your email address, you’ll gain instant access to the pattern download and everything else in the Make & Do Crew Vault. 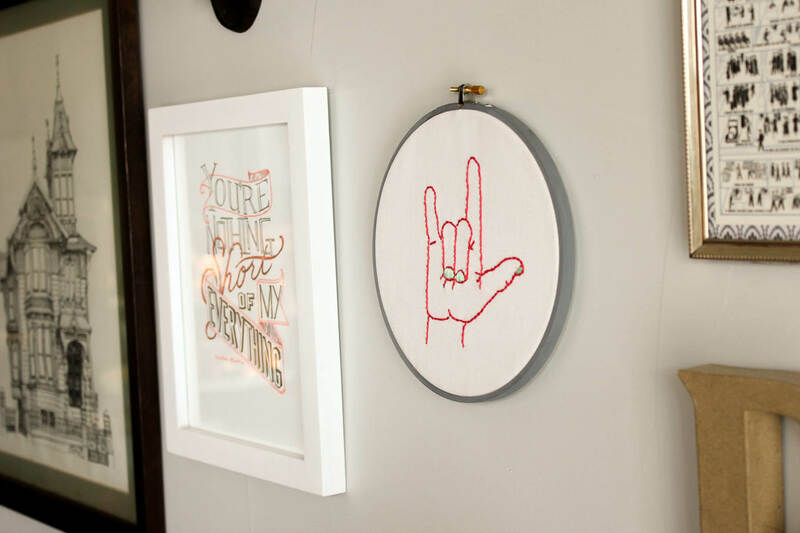 I used a 7″ hoop to frame my design, but the free pattern download includes versions for 5″, 7″ and 8″ hoops. 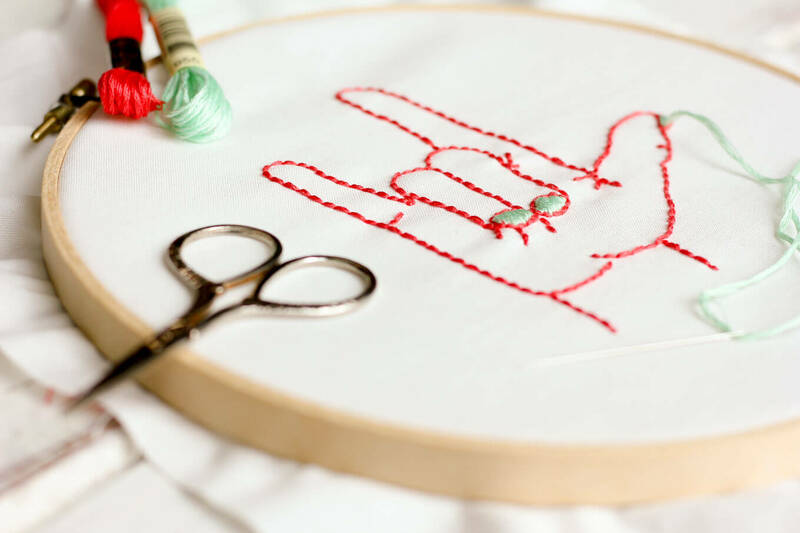 If you’re new to embroidery, this is an awesome pattern to start with because it only involves two stitches. 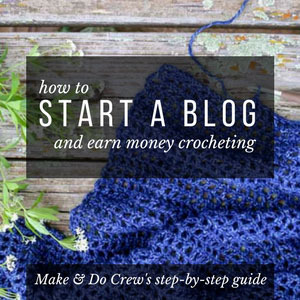 For an explanation of the stitches used, check out this tutorial from Craftsy. 1. Trace the pattern onto your fabric. If you’re using carbon paper, this means you’ll layer your fabric on the bottom, the carbon paper (carbon side down) on top of the fabric and the pattern on top of that. Then trace around the pattern with a pencil or pen, pushing down quite hard. 2. 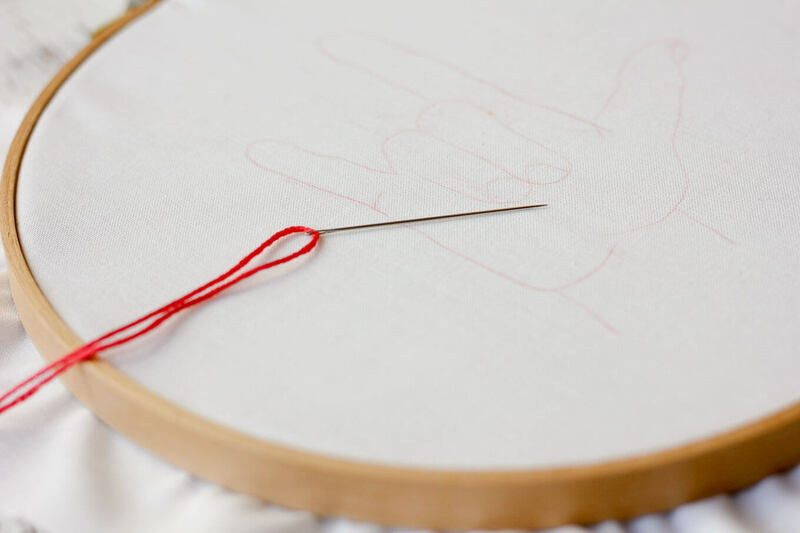 Outline the hand using a backstitch. 3. 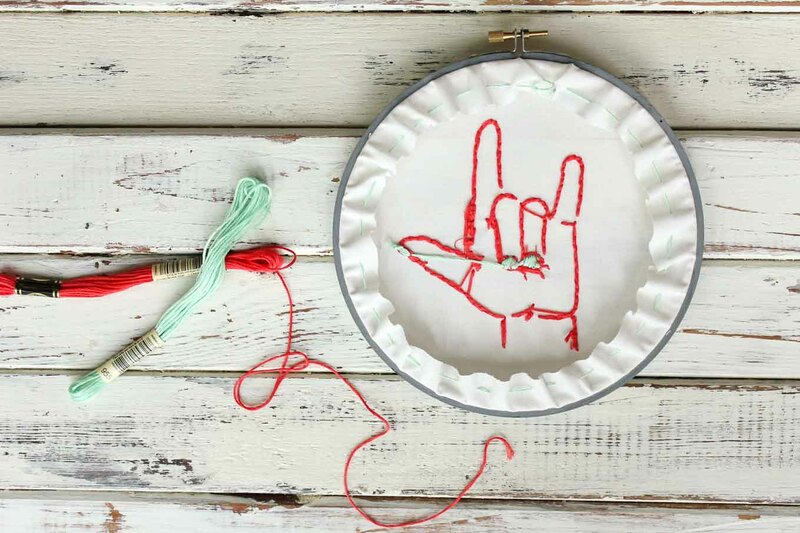 Give the hand a quick manicure by filling in the fingernails with a satin stitch. 4. 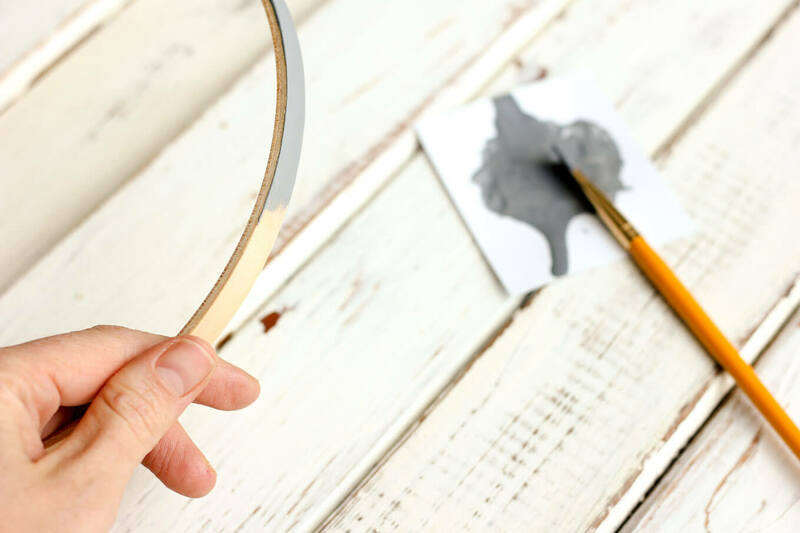 Paint your hoop, if you’d like. 5. 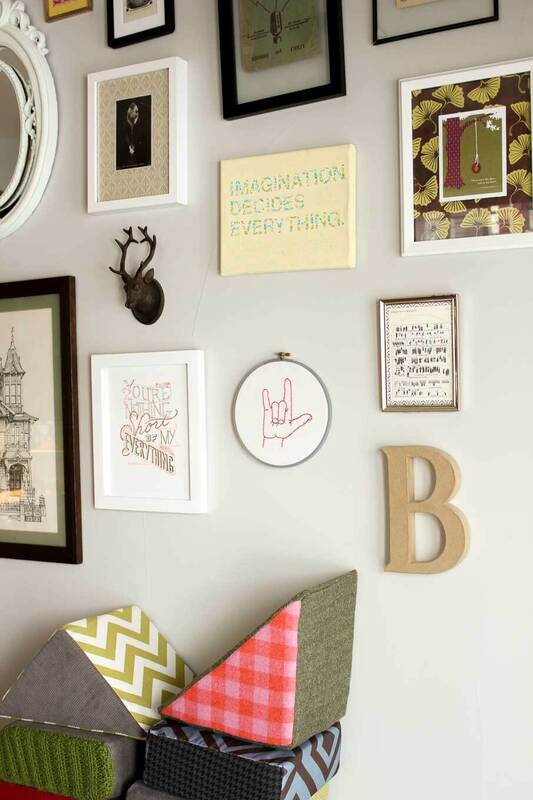 Trim the fabric so about 1″ extends beyond the hoop. Sew a running stitch around and pull to gather it tight. Tie off. 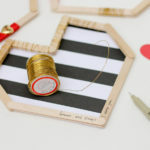 And for lots more fantastic ideas involving needles and thread, follow me on Pinterest! 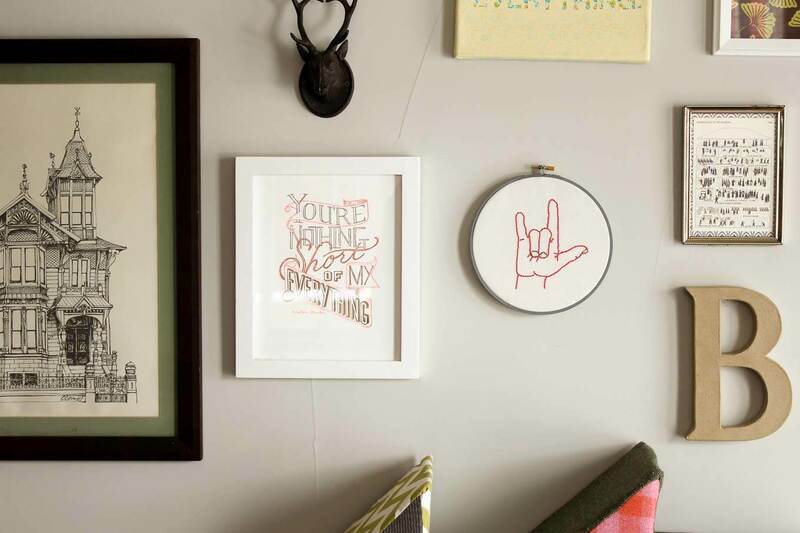 Can I have access to the I love you embroidery sign? Yes! You sure can! 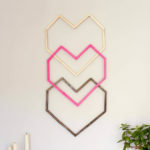 Simply enter your email address at the bottom of the post in the box with pink and green. You should immediatly get an email with download instructions. Let me know if you have any trouble! 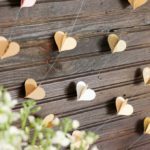 Not only a sweet craft but a very sweet story behind it too ! We can all use a bit more love in the world. It sure is! If you subscribe in the box above, you’ll receive a link and password to download it.